The application of aluminum foil alloy 8011 is varied, ranging from yoghurt cover foil, medical packaging foil, household foil, food container foil, automotive heat shield foil to tape aluminum foil. What kind of characteristics does 8011 aluminum foil have? In general, the aluminum foil is light in weight, good in ductility, thin in thickness, and small in mass per unit area. However, the strength is low, it is easy to tear, and it is easy to break when folded, and holes are generated, so it is generally not used for packaging products alone. In many cases, it is compounded with other plastic films and papers to overcome its shortcomings. Aluminum foil alloy 8011 has high barrier to water, water vapor, light and fragrance, and is not affected by the environment and temperature. Therefore, it is often used for perfume packaging, moisture-proof packaging, etc., to prevent moisture absorption, oxidation and volatilization of package contents. It is especially suitable for high temperature retort sterilization packaging of food. The surface of the aluminum foil 8011 naturally forms an oxide film, and the formation of the oxide film can further prevent the continuation of the oxidation. Therefore, when the package contents have high acidity or alkalinity, the surface is often coated with a protective coating or coated with PE to improve Its corrosion resistance. The high temperature and low temperature state of the aluminum foil is stable, the temperature does not shrink and deform at -73~371 °C, and has good thermal conductivity, and its thermal conductivity can reach 55%. Therefore, it can be used for high temperature cooking or other hot processing, and can also be used for frozen packaging. 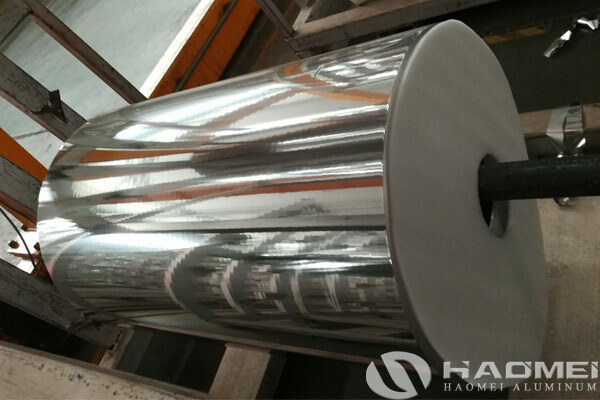 Aluminum foil alloy 8011 has good light-shielding property, its reflectivity can be as high as 95%, and its appearance is silver-white metallic luster. It can show good packaging and decoration effect through surface printing decoration, so aluminum foil is also a high-grade packaging material.